Yoga has grown not only as a way to maintain physical fitness but also as a spiritual practice for a healthy mind. It keeps the body flexible and increases muscle strength. It is also beneficial for bone health and keeps the joints strong. Yoga also helps in regulating the blood flow in the body. Its benefits are endless. 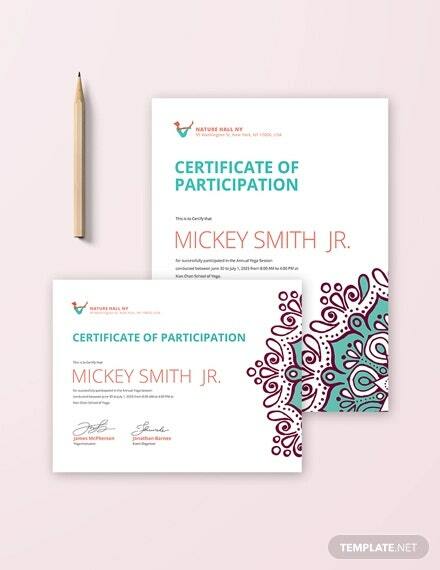 Yoga certificate samples can be useful for making yoga Certificate Templates to attract people to join and work in yoga classes. This template maintains a beautiful combination of red, white and black which adds a certain charm and dignity to the template. Also, the template is 100% editable and customizable. 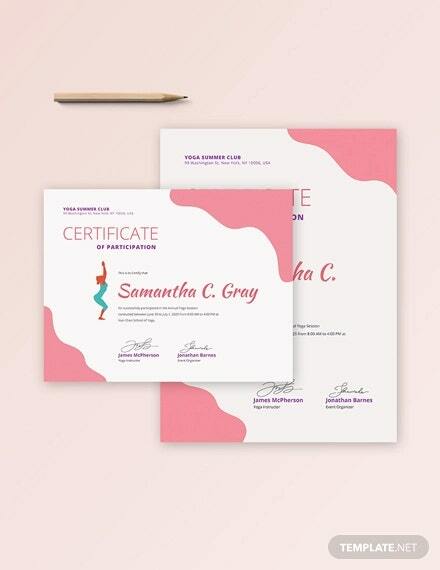 This yoga certificate template comes with an attractive design that doesn’t look too flashy or overwhelming. It is bright, vibrant, attractive and well designed. 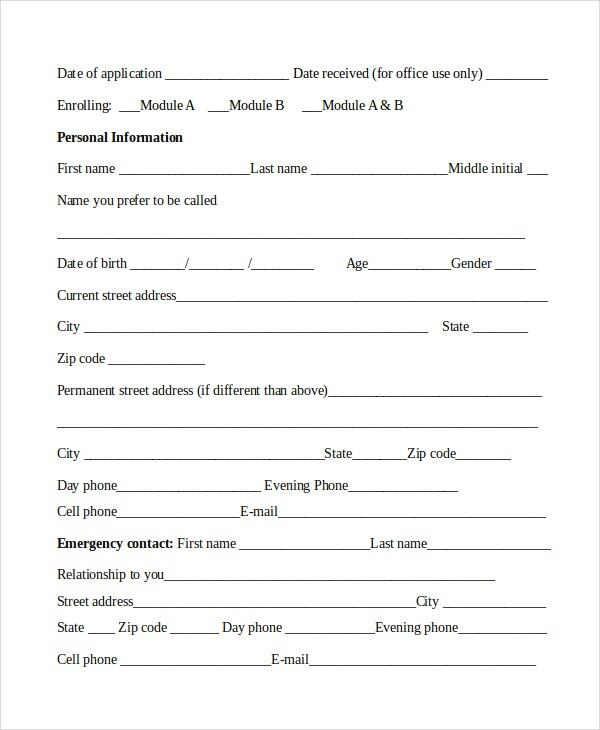 Plus, it comes in Word format. This template comes in a standard size and in a Word or PSD format. Plus, it comes with high resolution images and a CMYK colour mode. The text and colour on the template are fairly easy to edit. 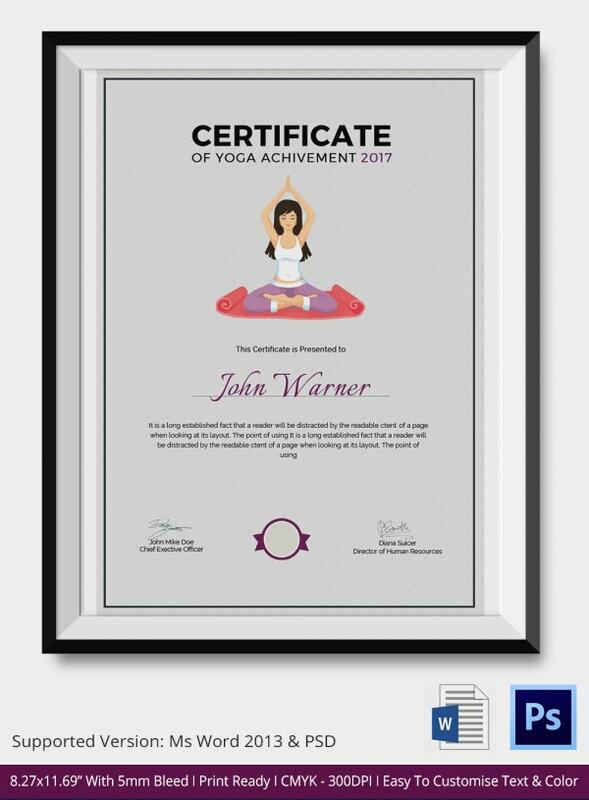 This yoga certificate template would be perfect for recognising the effort put in by a particular student. The template has been kept formal, professional and to the point in terms of appearance. This template would be perfect to award a person who has taken part in a yoga workshop or something similar. The template comes with high resolution images, attractive colour schemes and editable text. This is a gift certificate template that can be used to make gift certificates for yoga classes. It can be used to give cash discounts to people on different programs in order to lure them to join the mentioned yoga class. The name of the bearer of the certificate, the value of the discount and the name of the institution has to be mentioned in the certificate. You may also see Medical Certificate Templates. It is useful to attract those willing to become yoga teachers or in any other related discipline. It requires the information of the trainee, residential as well as physical addresses along with the programs he or she is interested in. 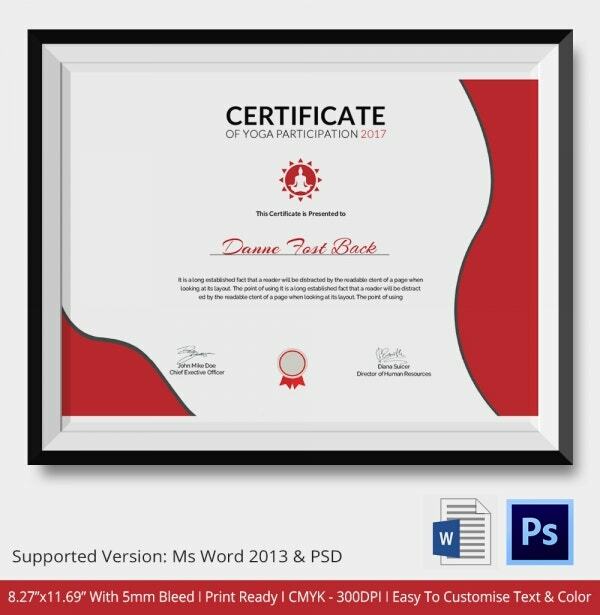 This is another certificate template for people who wish to become trainers in the field of yoga. It is useful for institutions which provide certificate courses which also allow the trainee to specialize in different aspects of yoga along with generic practice. It is for a home study course and not for any institution. 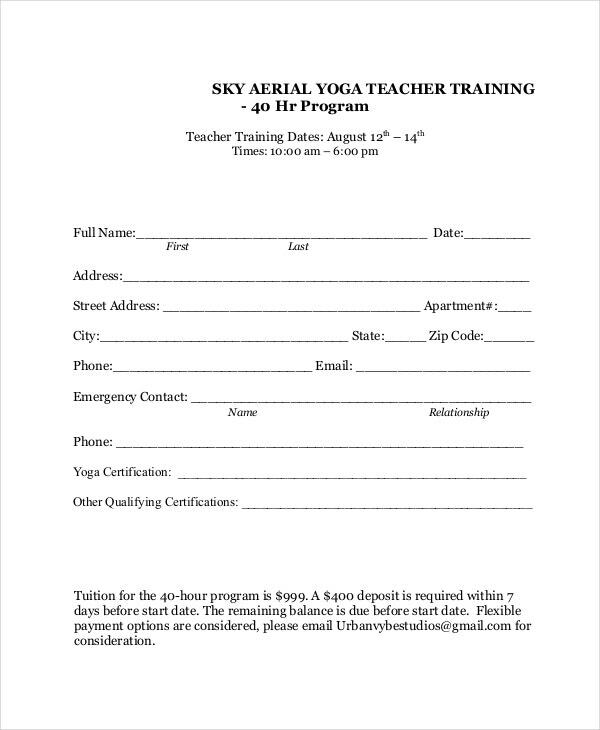 This certificate template is for institutions which plan on teaching and training yoga therapists and teachers. The template is useful for institutions which teach use of yoga in a therapeutic way. 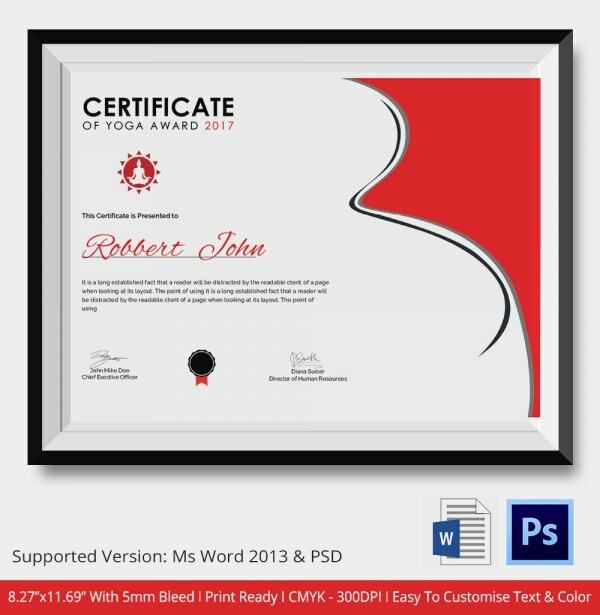 > What is the Use of Yoga Certificate Templates? 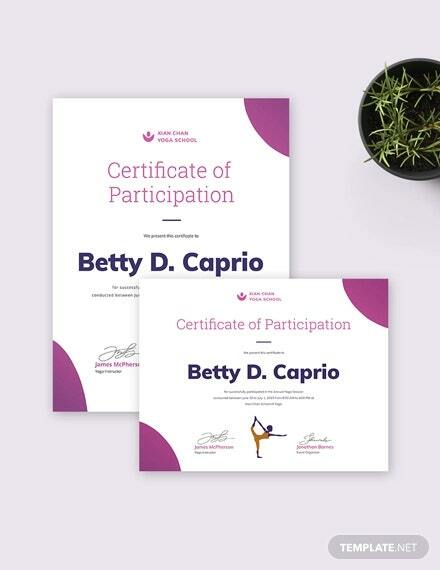 Yoga certificate templates are useful for readily making certificates which can be given to people who have undergone training in practicing or teaching yoga. Certificates are usually lengthy and a lot of details are included in them like the address of the trainee, educational history, physical state, health problems, etc. 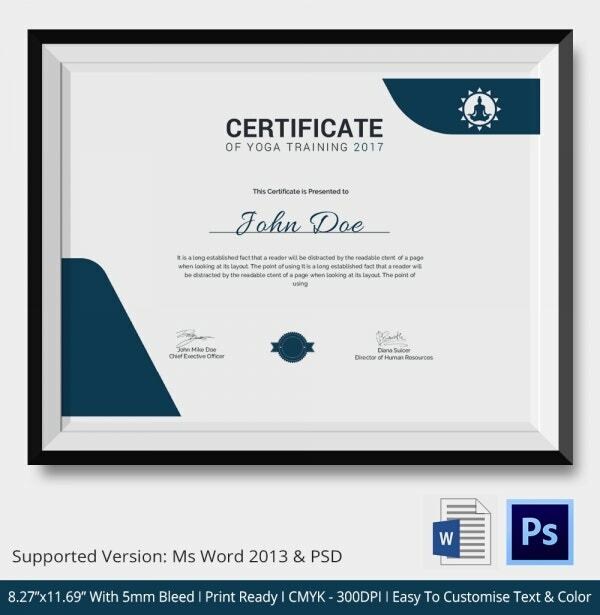 You may also see Word Certificate Template. Use of certificate templates can be very beneficial as instead of creating all the required fields, one has to only edit the name of the institution and thus have a readily available certificate with minimum effort. Various types of certificates are available for different types of yoga programs. > Who can Use the Yoga Certificate Templates? 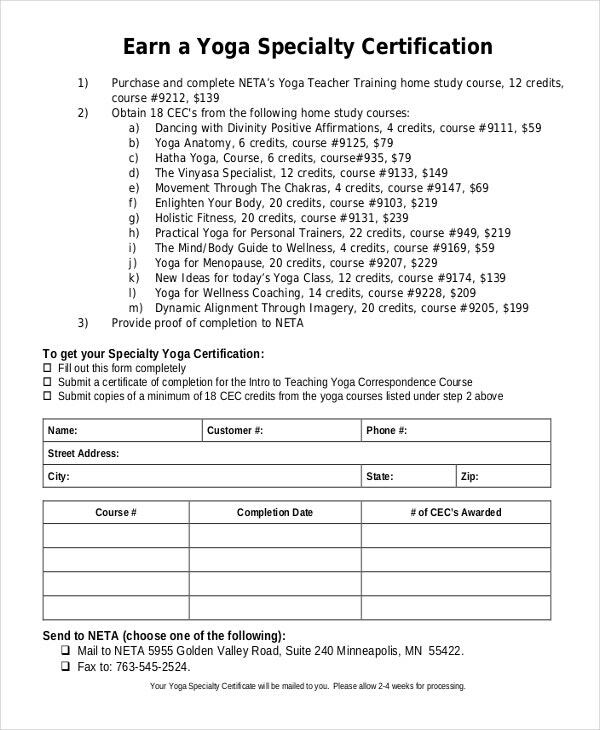 Yoga certificate templates can be used by any institute which provides a certification course in yoga. The course can be either general or specialized. Yoga certificate templates can be used by institutions which train the person in physical practice in their institutes and also by those institutes which provide a correspondence course where people can complete the course from their homes. Gift certificate templates can be used by any institute which teaches yoga not for the students to become professional trainers but to attain physical and mental fitness. You may also see Training Certificate Templates. 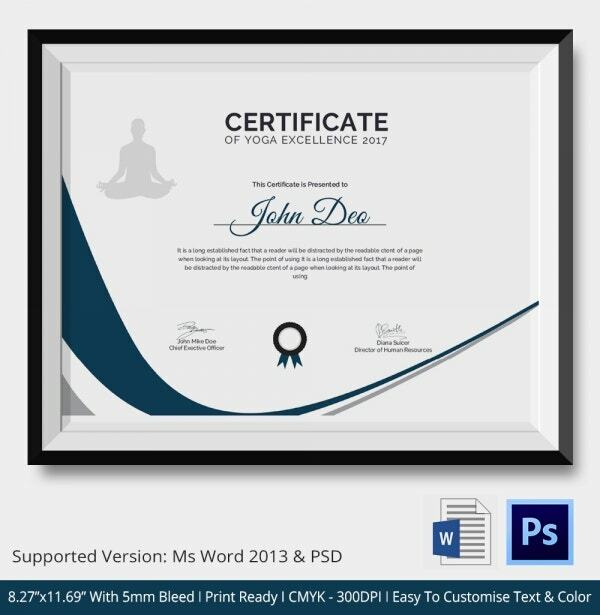 > What are the Benefits of Using a Yoga Certificate Template? 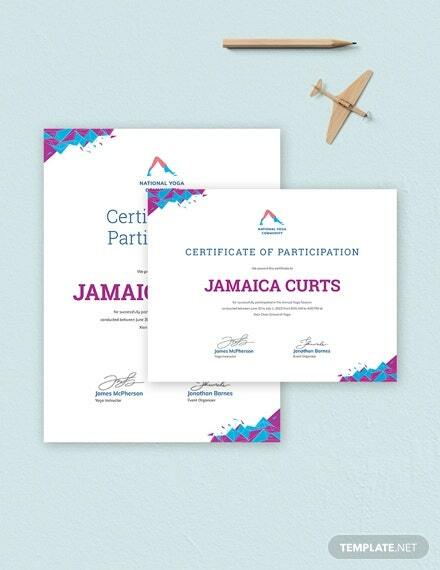 As the making of a certificate can be a lengthy and tiring affair, using a certificate template can make that job drastically easy. A lot of details have to be put in the making of a certificate, for both the trainee and the institute. Huge numbers of fields have to be generated to be filled in the certificate for the trainee. Manually creating each field can take a lot of time. These yoga certificate templates have been taken from reliable sources and thus, one has to only edit the name of the institute by replacing it with their’s and in this way, with minimum efforts, they can have a certificate ready for their program. You may also see Share Stock Certificate Template. Templates are available for various kinds of yoga programs. By choosing the one which suits the needs best, one can generate one’s own physical fitness certificate with minimum effort. All the certificate templates are from reliable sources and one doesn’t have to worry about using them.